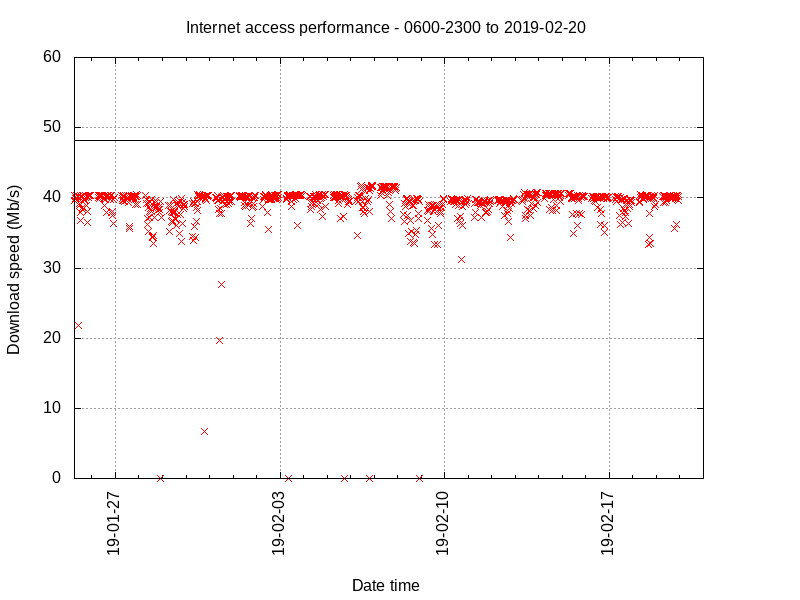 Above is a plot of download speeds over the month of service. As a result of behavior of the industry, the ACCC gives some guidance on terms used to advertise a service, and a service expectation. 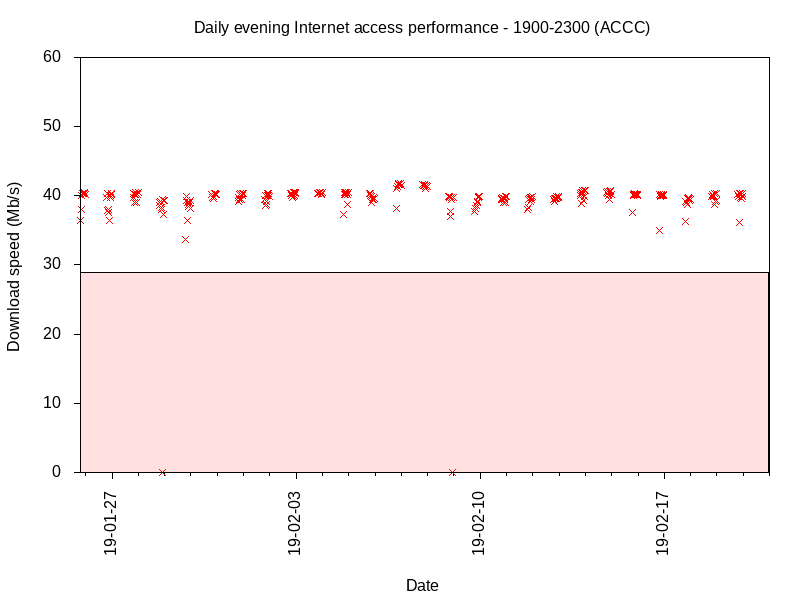 Above is a plot of speed tests during the defined “evening hours”, and it is generally very good with the exception of two recorded tests of 0Mb/s. The integrated ATA in two unlocked gateways did not work with Sumo / Optus for VOIP services with two different independent providers. Both VOIP services worked with an independent ATA, but failed after about three days even though there was a traceroute path from the ATAs to the associated SIP and STUN servers on other ports, indicating a failure of NAT somewhere. 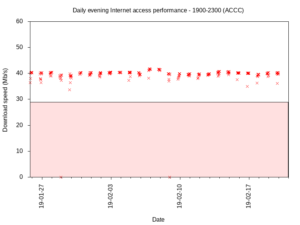 The gateways and ATA proved reliable on the previous and subsequent access services. Similar problems were experienced with SouthernPhone / Vocus. Are the failures due to an incompetent / untested solution, or deliberate actions on the supplier’s part to capture VOIP revenue for their own network? 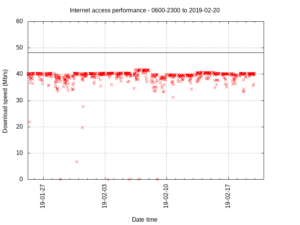 I have certainly encountered problems in using an independent VOIP provider with iiNet (supplied gateway locked to their own SIP server), SoutherPhone/Vocus (would not connect), and Sumo/Optus (connection failure / reliability problems). This is not a type of problem that RSPs are likely to fix quickly if at all, and the expedient approach is to choose another supplier (that does not use private IP addresses for the gateway to minimise risk). Experience is that although it is possible to cancel contracts without penalty when the supplier does not perform, it usually involves the TIO and that introduces significant delay during which service remains disrupted. I have come to view that because of the wide scale failure to deliver a service as promised, one should exclude all offerings that involve large initial costs or early termination fees.